Dorf got himself a bit of a tummy, and a blank expression on his whittle little head (which, as usual, he is scratching)! 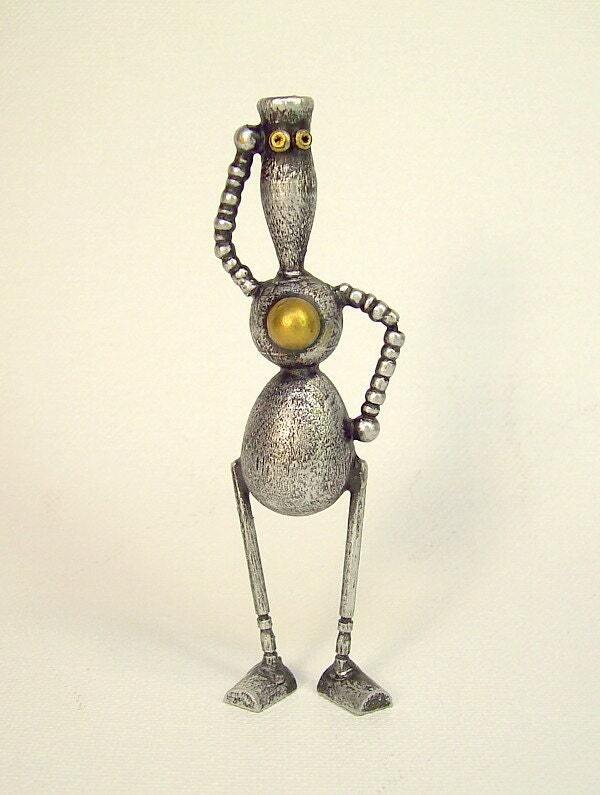 This bot is done in a silver metalic finish with gold highlights including his heart button on his chest. Dispite his spindly legs he stands alone ... that is free, with no support! He is about 3 1/2" inches tall (reminder there are 2 1/2 cm in an inch)! Made almost 100% from wood (sometimes with tiny amounts of other things) I paint and / or finish these with dark undertones and shading to highlight the details and then use layers of metallic and / or other coloring and finishes, making sure a lot of details shine through, often even the wood grain despite high tech themes. They maintain a retro, sometimes rustic look and feel to them, like an "olde worlde" toy or something.